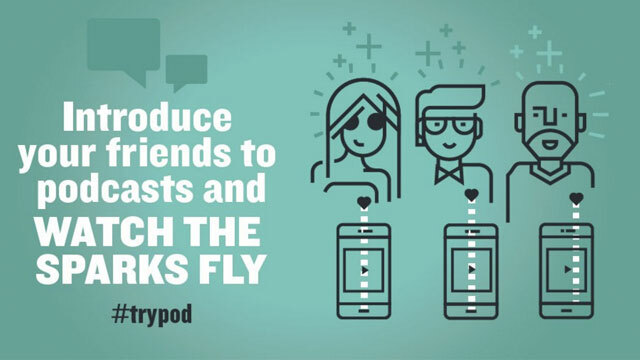 It’s fitting that #trypod, essentially a word-of-mouth campaign to promote podcasts debuting in March, grew its partner base of podcast producers through word of mouth. Israel Smith, NPR’s senior director of promotion and audience development, who broached the idea at a meeting late last year with a group of podcast producers, tells a story that illustrates that point. He describes an email he received from a New York podcast producer two weeks ago about a conversation that happened during a podcasting meetup. There are now more than 37 podcast producers who have signed on to the effort, including National Public Radio, American Public Media, ESPN, First Look Media, FiveThirtyEight, Gimlet Media, HowStuffWorks, Panoply and PRI, and that’s not counting a whole network of NPR member stations. Beginning on March 1, hosts of podcasts produced by those participating partners will encourage their listeners to spread the word and get others turned on to podcasts. The campaign is accompanied by a social media component unified under the #trypod hashtag, which is already making the Twitter rounds ahead of the launch. In addition to asking listeners to talk to their friends and family about podcasts, they will also be asked to teach others how to use podcasts, as well as do their part to counter misunderstandings like the idea that podcasts cost money. "The notion that an entire industry has come together to try an experiment to grow an audience base in this really organic way has felt really good." “We’ve heard from various technology partners we work with that the number of people out there who still aren’t quite sure which app to push on their phone is higher than one might think, and podcasting maybe still isn’t as easy as you might think.” It’s something that Smith feels prevents the podcast audience, which currently includes about a fifth of Americans who listen every month, from growing at an even faster clip. Smith calls it a “classic tell a friend campaign,” and its ultimate success rests on the premise that an enthusiastic audience base will be more than willing to participate. “Really, the trypod campaign doubles down on the basic principle of, when you have a loyal and devoted audience, if you ask that audience to activate on behalf of something they care about, they’ll step up and do it,” says Smith. The fact that the words of encouragement will come from the hosts is key. “We know one of the most powerful forms of promotion are host-read promos, as opposed to things read in an announcer’s voice, so one of the core principles is that everything would be host read,” says Smith. Equally important has been the collaborative effort among producers who see the benefits of working together as surpassing that of a zero-sum fight for new audiences. It’s something that is already embedded in podcasting culture, supported, Smith says, by research that shows “the best way to promote a podcast is to have it mentioned on another podcast. Lots of different publishers have experimented with trading spots,” says Smith.